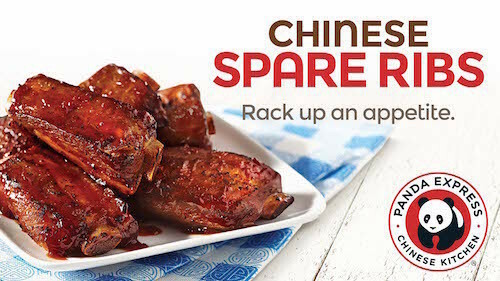 Panda Express Introduces Chinese Spare Ribs! In the mood for some Chinese food? I absolutely love Chinese food and so does the rest of my family! I personally have been in love with Panda Express for as long as I can remember. We’ve gone there for many a date night, with our kids in tow and even alone. (I will confess to a few trips through the drive thru by my own sweet self when I was having a craving!) Heck! I even remember begging my husband (more like pleading) to take me there when I was having a horrible bout of morning sickness and it was the only thing I felt I could eat at the time. Thank goodness for patient husbands! The biggest reason why we love Panda Express is obviously how wonderful their food tastes, but a close second is convenience and price. I know, if I’m ready to quench a Chinese food craving, I can drive to Panda Express and be in and out in minutes and not bust my budget! You can even Order Online now! Since it’s founding in 1983 Panda Express has been a family-owned company dedicated to making delicious high-quality food that helps bring families together. Amen to that! We have chosen Panda Express for our special Christmas Eve Dinner the past 2 years! It’s always fun to see new things added to menu and this time Panda Express did not disappoint! I’m excited to announce (drum roll please!) Panda Chinese Spare Ribs! If you thought you tried it all, think again! Chef Andy Kao, who has been with Panda Express for over 30 years, created this delightful dish. Panda Chinese Spare Ribs are an innovation, bringing together the best of Chinese Char Siu Barbecue with American slow-cooked St. Louis-style spare ribs. You can also find out more about Panda Express dishes by visiting their Facebook, Twitter, and Instagram. Their Pinterest page is also full of wonderful, delicious DIY ideas. Be sure to check it out!